Growing a field of typical edible greens can be thought of as nature-meets-science. But Emma Self Treadwell, founder of Green Girl Produce, has learned that for microgreens to grow, nature and science have to go beyond the meeting to a full-on nature-science embrace. Several years ago Emma was an artsy, nature-loving Southern farm girl with a crazy idea: to grow a multitude of microgreens—indoors, without soil. She launched her Green Girl Produce eco brand after an intense 48-hour pitch and planning session with mentors and investors at Launch Memphis in 2012. 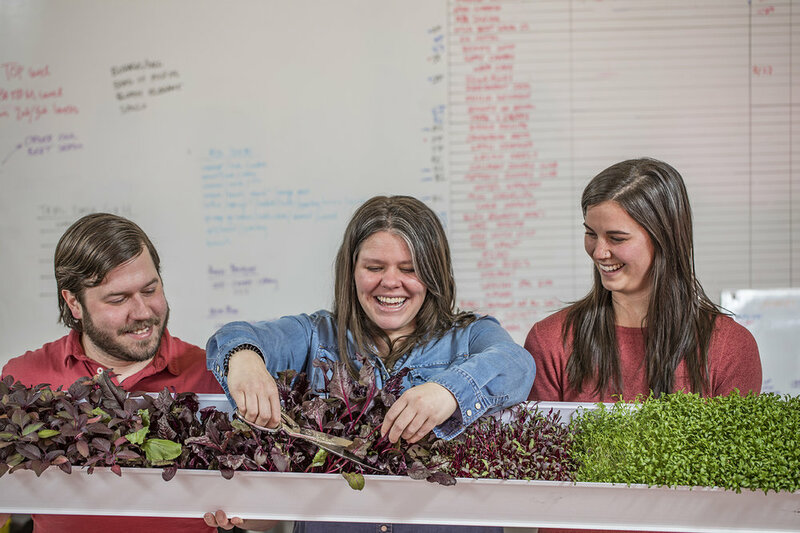 As Tennessee’s first indoor vertical farm, Green Girl specializes in microgreens—a gourmet mix of tasty, nutritious greens—cultivated in Midtown Memphis. Emma uses a hydroponic system, which is a soilless method of growing plants in a water-based, nutrient-rich solution. The basic premise behind hydroponics is to allow the plant roots to come in direct contact with the nutrient solution, while also having access to oxygen, which is essential for proper growth. Advantages of hydroponics include using 90 percent less water than traditional farming, planting and harvesting despite weather conditions, and eliminating the need for pesticides, herbicides and other harsh chemical treatments. No stranger to farming, Emma, born and raised in Memphis, has deep roots in gardening and growing produce. Her mom’s family grew their own vegetables, and her dad grew up on a soybean farm in Marks, Mississippi. (The soybean meal was refined into vegetable oil at a place called Humko Oil Refinery, just across the street from where Green Girl is now located.) Growing up, Emma liked going down to the farm to play in the big trailers filled with cotton and ride around with the guys driving the big tractors. Sitting on her dad’s lap, she learned to drive a Bronco on all the dirt roads in and around the farm. Emma studied fine arts and crafting at Tennessee Tech University’s Appalachian Center for Craft in Smithville, Tennessee, receiving a degree in textiles with an emphasis in woodworking, ceramics and metalsmithing. While in college, she studied abroad in Peru, working with a community of weavers—women who trained her in process, attention to detail and mastering color. She later taught art and gardening at Evergreen Montessori School (now closed) before hitching her wagon to the restaurant industry, specifically as a waitress at Sweet Grass. Working with Chef Ryan Trimm and other local chefs, she found herself drawn to the world of fresh farm-to-table produce. She would later meet restaurant owner and entrepreneur Taylor Berger, who encouraged her to pursue Green Girl Produce. Growing microgreens ethically with hydroponics offers challenges, including system set-up, pumping, water supply, maintaining proper nutrients and plant maturity. But Emma has found that her crafting and farming skills work hand in hand to help her meet these challenges. She loves building and constructing and designed a meticulous system for growing microgreens. In fact, all of her prototypes and irrigation systems were crafted by hand using materials she repurposed to create superb functionality. After five years in business, Emma recruited two experts to help expand capacity: Rob Coleman, her operations manager with a biology degree, and Jennifer Marshall, a fellow farmer who assists with growing, sprouting, harvesting and promoting their “green” brand on social media. Green Girl processes about 50 pounds of micro and baby greens weekly. These microgreens are more than fancy garnishes, they are bursting with flavors of celery, carrots, radishes and leeks. Chefs love them because they provide a bit of elegance to top off their dishes, and a memorable taste. With the flavorful selections, some use microgreens to increase their intake of veggies through the straw of a fresh green smoothie. “Memphians need fresh produce daily to enhance their physical and mental attributes,” says Jennifer. Green Girl resembles a boutique indoor farm and believes in catering to the specific individual. Like individuals, Emma’s plants encompass different personalities. 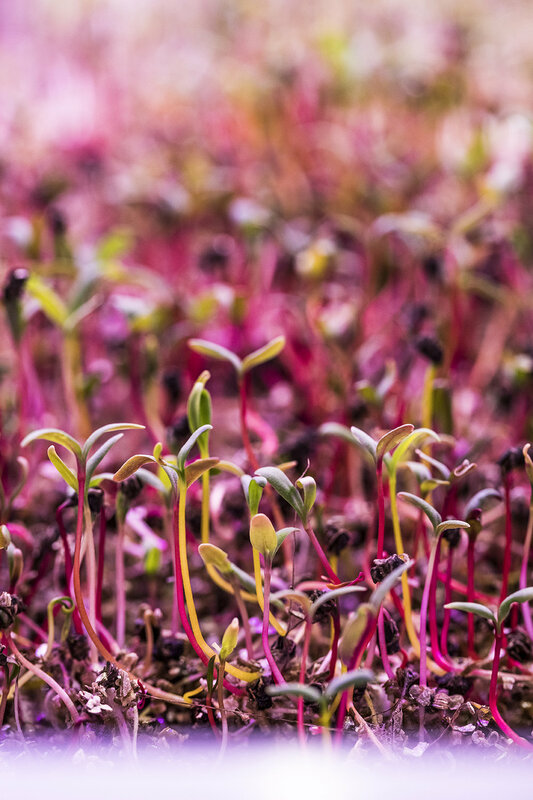 Emma’s microgreens are branded by name, including Band of Misfits, one of her most popular mixes with a balance of nutty, sweet, earthy and tart flavor. If you want spice, then try Spicy Green Girl, a blend of red and green mustards with a peppery kick of flavor. Her newest concoction is Mirepoix Mix, an herbaceous mix of micro leeks, carrots and celery. Currently Green Girl partners locally with Folk’s Folly, Sweet Grass, Next Door, 117 Prime, The Peabody, City Silo, Sushi Jimmi, The Grove Grill, The University Club, Dixon Gallery and Gardens and personal chefs such as Andrea LeTard, author of Andrea’s Cooktales. They plan to offer microgreens to consumers at the Cooper-Young Community Farmers Market in the near future. To learn more about Green Girl Produce, visit greengirlproduce.com or follow them on Instagram @greengirlproduce_901. Erika Cain is a communications vet with chops in writing, public relations, graphic design, TV, radio and brand strategy. She is a skilled storyteller and has been a trusted adviser to executives and companies for almost two decades. Erika founded GIRL 24, a business mentoring initiative to help build a culture of gifted and ingenious female leaders. She is a spouse, mom, speaker, community volunteer and member of Junior League, and loves dissecting brands. Justin Fox Burks has been a professional photographer for 20 years, but that’s not all. He photographed and co-authored two vegetarian cookbooks, The Southern Vegetarian: 100 Down-Home Recipes for the Modern Table and The Chubby Vegetarian: 100 Inspired Vegetable Recipes for the Modern Table. He feels fortunate to be able to make interesting images for a living.